James Edward Talmage was born Sunday September 21, 1862, at Hungerford, Berkshire, England, the son of James Joyce Talmage and his wife, Susannah Preater. He is the first son and second child in a family of eight. He was baptized and confirmed a member of the Church of Jesus Christ of Latter-day Saints at the place of his birth, June 15, 1873, and on the 18th of the following August was ordained a Deacon in the Ramsbury Branch of the London Conference. The entire family left England on May 24, 1876, landed in New York on June 5th, and arrived in Salt Lake City on June 14, 1876. In Provo, Utah, where the family established a home. James was later ordained a Teacher on December 17, 1877, and an Elder on June 28, 1880. James E. Talmage photographed as a boy in Utah. Talmage had obtained his early schooling in the National and Board schools of his home district in England, and was an Oxford diocesan prize scholar in 1874. 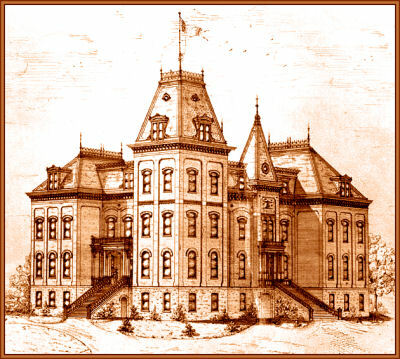 In Provo he entered the Brigham Young Academy high school sometime in 1876. He followed to completion his high school courses in 1879, graduating as a member of the Class of 1880, taking the Normal courses in preparation for becoming a teacher. At the age of 17 he became a teacher of Elementary Science and English at Brigham Young Academy. 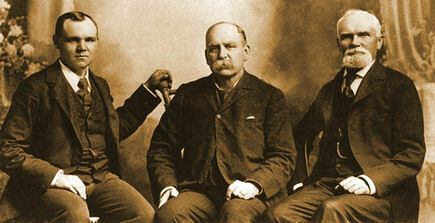 In 1881, Talmage received a collegiate diploma from the BYA Scientific Department, the first such diploma to be issued. His early predilection was for the sciences, and in 1882-1883 he took selected courses in chemistry and geology at Lehigh University, Bethlehem, Pennsylvania. Though a special student and not a candidate for a degree, he passed during his single year of residence nearly all the examinations in the four-year course and later graduated; and in 1883-1884 he was engaged in advanced work at Johns Hopkins University, Baltimore, Maryland. He returned to Utah in the fall of 1884, in response to a summons from Principal Karl G. Maeser of Brigham Young Academy, and served as professor of Geology and Chemistry, with varied activities in other departments, in the Brigham Young Academy from 1884 to 1888. While still a member of the faculty, he was elected a member of the Board of Trustees of Brigham Young Academy. During his residence in Provo, he served successively as city councilman, alderman and justice of the peace. On September 29, 1884, he was ordained a High Priest, and was set apart as an alternate High Councilor in the Utah Stake. Much later, one of his daughters told this story about her father: "James E. Talmage was very intent on getting an education even to the point that he got his doctorate at the age of twenty-one. He was just so busy that he hadn’t had a chance to do anything to look for a wife, but he knew he should. "So he went into the mountains after fasting and praying that he would be able to know whom he should marry. He felt that the Lord had the big picture. There he had a clear impression in his mind of a girl who lived in a nearby small town. So he went to her home. When she came to the door he knew she was the one, and shortly thereafter they were married." On June 14, 1888, Talmage and Mary May Booth married at the Manti Temple. She was the daughter of Richard Thornton Booth and Elsie Edge Booth. From this union came the following children: Sterling B. Talmage, born May 21, 1889; Paul B. Talmage, born December 21, 1891; Zella Talmage, born August 3, 1894 -- died of pneumonia April 27, 1895; Elsie Talmage, born August 16, 1896; James Karl Talmage, born August 29, 1898; Lucile Talmage, born May 29, 1900; Helen May Talmage, born October 24, 1902, and John Russell Talmage, born February 1, 1911. In 1888, Brigham Young Academy's principal, Karl G. Maeser, was called to serve as the first Superintendent of Church Schools, although he was not immediately relieved of his duties as Principal of the Academy. The following year the Board of Education conferred on Principal Maeser the degree of Doctor of Letters and Didactics, rewarding him for his efforts in traveling throughout the west, establishing academies throughout the Church. With Principal Maeser away much of the time, the Brigham Young Academy Board of Trustees selected James E. Talmage to replace Dr. Maeser as Principal. Talmage with the high school Class of 1889. Professor Talmage accepted the principalship, but never served. He had done little more than outline plans for the ensuing year when he was called by the presiding authorities of the Church to the principalship of the Salt Lake Academy, afterwards the Latter-day Saints College and still later the LDS University, in which office he continued through 1893. Dr. Karl G. Maeser continued on as Brigham Young Academy Principal. In 1890, when Benjamin Cluff, Jr. returned from the University of Michigan with his bachelor's degree, he was made Assistant Principal, a position he held until January 4, 1892, when he became the second principal, following Dr. Maeser. Meanwhile, on February 17, 1892, the Territorial Legislature changed the name of the University of Deseret in Salt Lake City, to the University of Utah. The Regents had earlier hired a well-known educator, John R. Park, to be Principal and later President. Under President Park, the University of Deseret had finally began to send down solid roots in the community, and would never again be forced to close. When President Park's health began to decline, however, he resigned as President in 1892; but before he did, he realized that the Union Square location was inadequate for a major university, and made plans to relocate the University to the east bench of the Salt Lake Valley. With that in mind, he began negotiations with the U.S. Army to obtain land at Fort Douglas, and the Territorial Legislature petitioned the U.S. Congress for a grant of land for a new campus. The stage was now set for the move to the east bench location, a move that would dramatically enhance the future of the University of Utah. James E. Talmage replaced acting president Joseph T. Kingsbury as President of the University in 1894, and served admirably for three years. In 1897, Dr. Kingsbury was once again appointed as President, this time in his own right. Kingsbury led the school for the next two decades. In 1897, when James E. Talmage resigned the presidency, he retained the Chair of Geology; and in 1907, ten years later, he resigned the professorship to follow the practical work of mining geology, for which his services were in great demand. In 1891, he had received the Bachelor of Science degree, and in 1912 the honorary degree of Doctor of Science, from his old alma mater, Lehigh University. In 1890 he was given the honorary degree of Doctor of Science and Didactics by the Church of Jesus Christ of Latter-day Saints, and in 1896 was awarded the Doctor of Philosophy degree by Illinois Wesleyan University for nonresident work. Dr. Talmage was elected to life membership in several learned societies, and for many years was a Fellow of the Royal Microscopical Society (London), Fellow of the Royal Scottish Geographical Society (Edinburgh), Fellow of the Geological Society (London), Fellow of the Geological Society of America, Fellow of the Royal Society of Edinburgh, Associate of the Philosophical Society of Great Britain, or Victoria Institute, and Fellow of the American Association for the Advancement of Science. Dr. Talmage traveled extensively, having traversed most of this country and of Europe many times in the course of scientific pursuits. He was a delegate from the Royal Society of Edinburgh to the International Geological Congress held at St. Petersburg (Petrograd) in 1897, and was a member of a party that crossed the Urals into Siberia. Throughout the period of his professional career as teacher and professor, Dr. Talmage was particularly active and efficient in encouraging scientific study by popular lectures and writings, and for this labor his deep love for science and his exceptional command of language and ability as a public speaker particularly fitted him. Impelled by the same spirit, he had taken charge of the little Deseret Museum in 1891, and had the satisfaction of seeing the institution become large and influential. He retained the directorship until 1919, when the Deseret Museum ceased to exist as a unified institution, its collections being divided to form the LDS University Museum, and the LDS Church Museum, respectively. In his teaching work Dr. Talmage was the first to establish courses in Domestic Science and Agricultural Chemistry in the intermountain West. 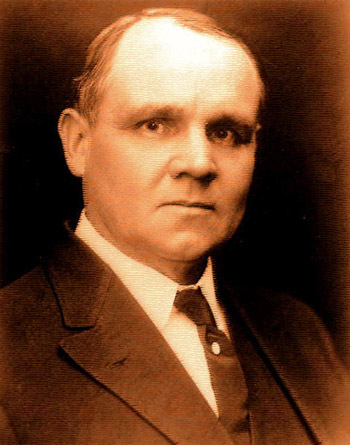 On December 7, 1911, James E. Talmage was appointed and sustained to be one of the Apostles, to fill the vacancy caused by the appointment of Elder Charles W. Penrose as second counselor in the First Presidency, and on the following day (Dec. 8th) was ordained an Apostle of the Lord Jesus Christ and was set apart as one of the Council of the Twelve Apostles of the Church of Jesus Christ of Latter-day Saints, under the hands of President Joseph F. Smith, assisted by his counselors and members of the Council of the Twelve. When called to special ministry in the Church, he promptly relinquished his profession as a mining geologist and engineer, the practice of which had grown to be extensive and lucrative, and from that time he devoted himself entirely to Church service. Dr. Talmage was the author of many scientific and theological works, among which are: "First Book of Nature" (1888); "Domestic Science" (1891); "Tables for Blowpipe Determination of Minerals" (1899); "The Great Salt Lake, Present and Past" (1900); "The Articles of Faith" (1899), a comprehensive exposition of the doctrines of the Church; "The Great Apostasy" (1909); "The House of the Lord" (1912), a discussion of holy sanctuaries, ancient and modern; "The Story of Mormonism" (1907); lectures delivered at Michigan, Cornell and other universities; "The Philosophical Basis of Mormonism" (1915); "Jesus the Christ" (1915); "The Vitality of Mormonism" (1919), and numerous pamphlets and contributions to periodicals. "Professionally a scientist and a preceptor, with gifts and powers equalled by few, Dr. Talmage is also a writer and speaker of great ability and skill. He is an absolute master of English, both by pen and tongue, and possesses a musical eloquence of marvelous fluency and precision. His style of oratory, though not stentorian, is wonderfully impressive, and his well stored mind, capacious memory, quick recollection and remarkable readiness of speech render him a beau-ideal instructor, in public or in private." In 1974, Brigham Young University named the James E. Talmage Mathematical Sciences and Computer Building in his honor. James E. Talmage was a member of the BYA high school Class of 1879. He served at BYA on the faculty of the Training School and as a Chemistry teacher from 1879 to 1891. He received the first collegiate diploma from the BYA Scientific Department in 1881. He served on the BYA Board of Trustees from 1886 to 1891. One of the most thrilling examples of the type of student produced at the "Y," through our secular and spiritual environment, is that of a young English immigrant who first enrolled at Brigham Young Academy in 1876. Two years later, at the age of sixteen, he graduated and immediately joined the faculty as an instructor in elementary science, Latin, and English. With the friendly encouragement of Dr. Karl G. Maeser and President John Taylor, the young Englishman journeyed back East and engaged in further study at Lehigh University and Johns Hopkins University. Thus, he was among the very first LDS students to obtain advanced training at eastern universities. Returning to the "Y," the young scholar was appointed as professor of geology and chemistry. Later he became assistant to Brother Maeser. While serving in this capacity, he was appointed to the school's board of trustees. Having tremendous civic vigor, he also served as Provo City councilman, alderman, and justice of the peace. Later, this English scholar was called to the position of president of the Latter-day Saints College in Salt Lake City. And five years later, he became president and professor of geology at the University of Utah. In 1911 he was called to the Council of the Twelve, and Dr. James E. Talmage served in this office with great ability and inspiration until his death in 1933, at the early age of seventy-one. I am convinced that Elder Talmage's life and his outstanding accomplishments were influenced to a marked degree by his experiences that he received from Dr. Karl G. Maeser. In this respect, I sincerely exhort each of you to remember that there may be many other "James Talmages" in our student body.